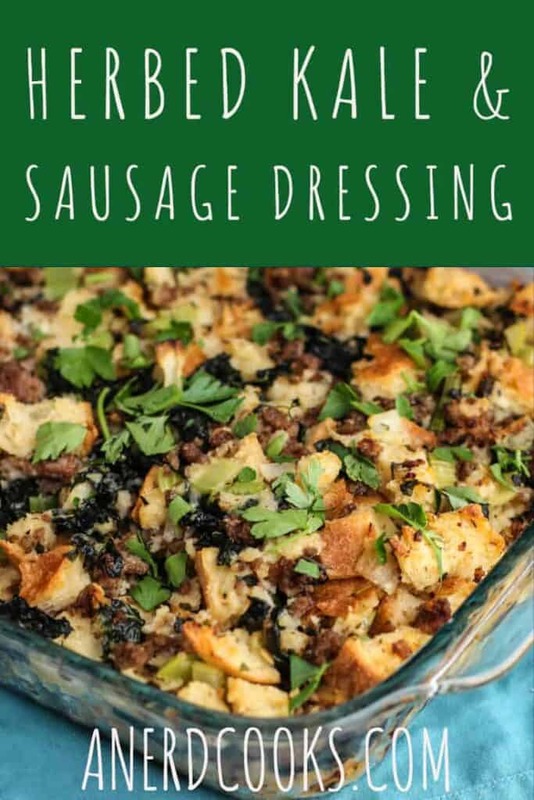 This Herbed Kale and Sausage Dressing has been my go-to dressing for the past couple of years. It’s savory, herby, and makes for excellent leftovers. Can we talk about the stuffing vs. dressing terminology for just a second? 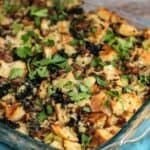 I have a hard time calling anything “dressing”, and almost always want to say “stuffing”. This is probably due, in part, to me growing up in Pennsylvania, where I don’t think think that “dressing” is part of our Thanksgiving food-related lexicon. However, I realize that anything of this nature that’s cooked in a pan is called “dressing”, while stuffing is technically stuffed into the cavity of the turkey, and cooked that way. But, let’s be honest, the concept of stuffing is actually pretty disgusting. 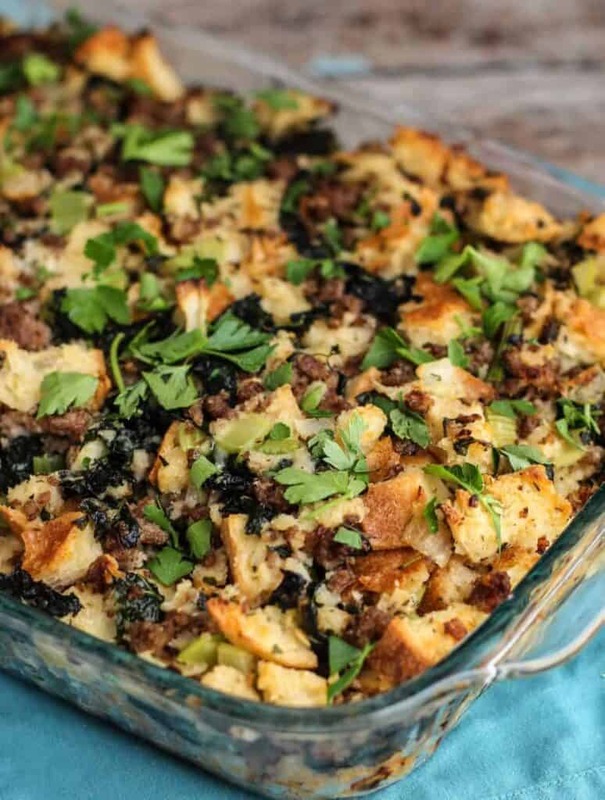 The innermost stuffing rarely has a chance to come up to a high enough temperature to be safe to eat. Enjoy that holiday meal with a side of gastrointestinal distress. Anyway… I suppose we should attempt to be as correct as possible here. So, “dressing” it is. Even though Thanksgiving has come and gone, this dressing would make a lovely addition to your table for Christmas dinner. Or anytime you feel like eating a ton of carbs, really. The leftovers are fantastic, too. Heat them up in the oven, microwave, or in a skillet. Enjoy as is or top with a runny egg (breakfast/brunch, anyone?). Perfection. This recipe comes from the blog Kitchen Konfidence. Cut or tear the bread into bite-sized cubes. Place it in a shallow baking dish and drizzle with the milk to saturate. Let it sit for 30 minutes, gently tossing things around occasionally to ensure that the bread is soaking up the milk uniformly. Heat a large heavy-bottomed pot or Dutch oven over medium-high heat. Add the sausage and cook through, crumbling as it cooks. Stir in the onion, celery, parsley, and garlic. Add a pinch of kosher salt and a few grinds of black pepper. Cook until the onion and celery begin to soften, stirring occasionally. Add the kale, 1/2 cup of water and another pinch of kosher salt. Cook until the kale wilts. This should take about 5 minutes. Transfer the bread to a large bowl. Add the sausage and kale mixture to the bowl along with the parmesan cheese, basil, rosemary, sage, 2 pinches of salt and several turns of black pepper. Gently toss the mixture until all ingredients are evenly incorporated. Give the dressing a taste and season with more salt and pepper, if needed. Transfer the dressing to a 9x13-inch baking dish. Whenever you're ready to bake and eat the dressing, you'll want to preheat the oven to 350 degrees F and bake uncovered until hot (at least 150 degrees in the center) and lightly browned. This should take about half an hour. You can prepare this dressing ahead of time. Just do everything short of baking it, cover it, and stash it in the fridge until it's time to bake. 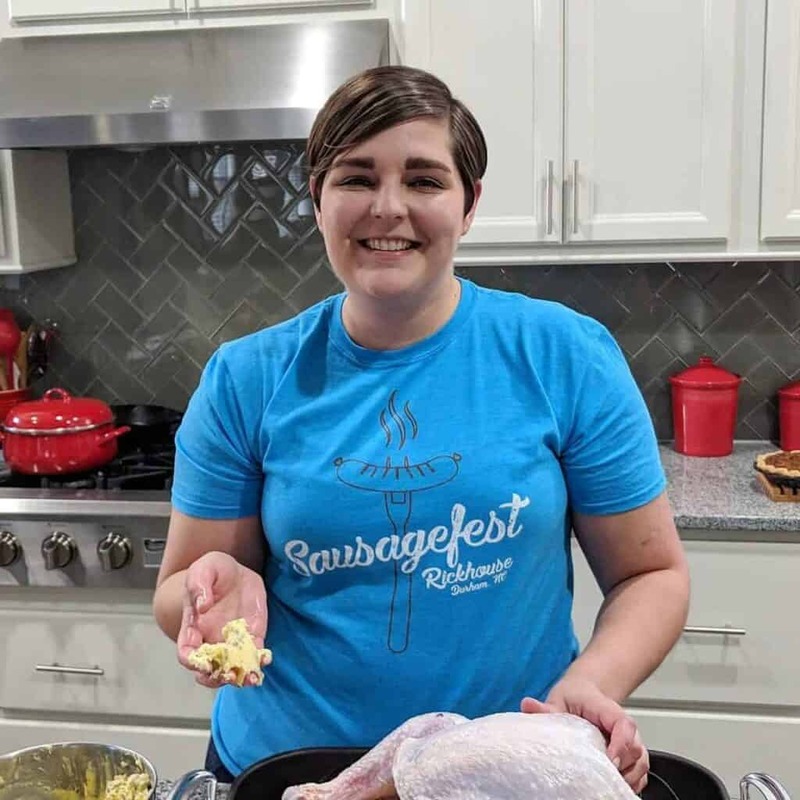 Need other Thanksgiving and holiday recipes? Check out my Hard Cider Cranberry Sauce and Skinny Green Bean Casserole!